The Studs (2012) | Come Here To Me! Out of the long list of Euro 2012 Irish Football songs, these are definitely two of the better and more intelligent ones. 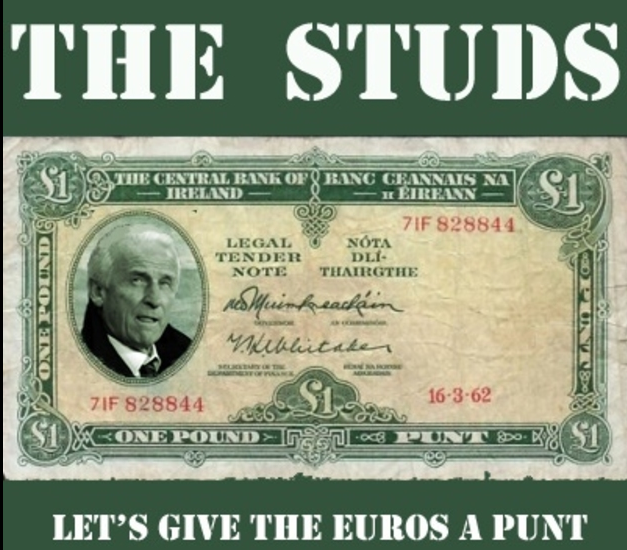 The Studs are an Irish pop punk five piece who have re-formed after 10 years to release a CD for The Euros 2012. The CD “Let’s Give the Euros a Punt” was launched on 17th May 2012 at The Grand Social, Dublin. Mentions of Bertie, WW2, Negative equity and a humorous list of currency related puns. A taste of ‘Bella Ciao’ and confirmation that Giovanni Trapattoni is not a Fascist. What’s not to like. The Studs last hit the airwaves with their three song EP for the World Cup 2002 campaign which included, in my mind, one of the best songs ever written about football or otherwise – Mick McCarthyism. http://youtu.be/ABmNjnNR9aM. He’s definitely not this! !